For feed we use NatureWise chicken starter grower crumbles (non-medicated) available at our local rural king, which is high (18%) in protein. Use newspaper around feeder for the first few days if they are having trouble recognizing where their feed is. 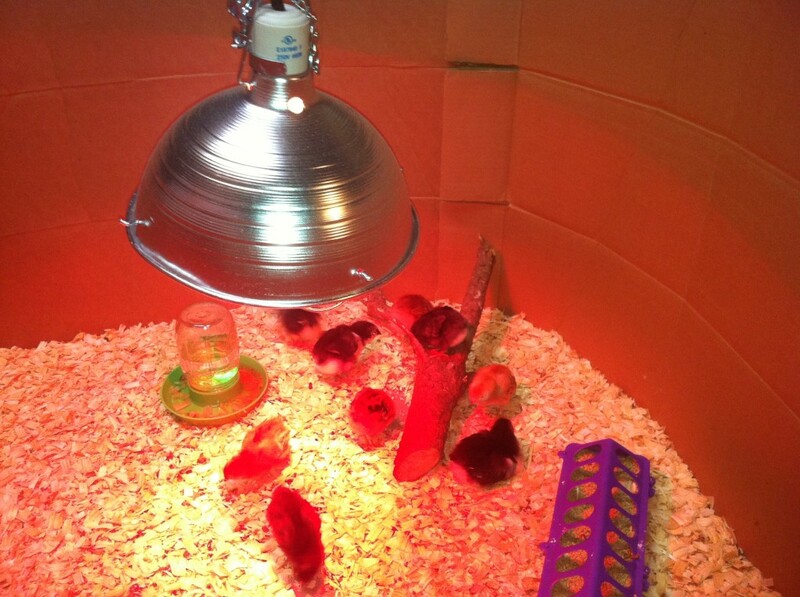 It is recommended to provide 2 foot of feeder space/25 chicks. We will feed our layer flock the chicken starter till around 16 weeks of age. After that age we will switch to layer feed. Once the meatbirds are old enough (4 or 5 weeks) to live outside in the chicken tractor, we will switch them over to meatbird crumbles (22% protein). For an idea of how much food do chicks need, check out the table below or click on the previous link. 2012 will be a year of new learning experiences with raising chickens for us. We have raised a laying flock before but we pretty much just let them free-range, keep them in a chicken tractor, or confined them to their coop and run. This year we will be using a pasture/forest garden paddock shift system for the layer flock, and raising and processing our own meatbirds for the first time. We plan on sharing these experiences with everyone along the way.